How Many Monitors do you use? How Much Time do You Spend on the Internet? What Chipset do you favor? How Long have you owned a Computer? When will you Dual Core? Sign up now to be notified of updates to our archive. Have you ever opened your tower to find your IDE cables in the way of almost everything inside? There are two main reasons why someone might want to have their cables round. The first would be to lower their temperature; cables are wide and decrease airflow inside the casing. Having better air flow would decrease the case temperature by a few degrees. Otherwise, it�s only really a question of cosmetics. Some people may have a window kit and are looking for that clean, sleek look. It is also easier to get at your parts when the cables are cleanly out of the way. There are two easy ways to sliming down your cables. The first way is to use a sharp bladed tool like a Xacto knife and separating the strands of wire. You will however, run the risk severing a wire that would then need to be replaced. With my first attempt on the floppy cable, I cut each strand one by one. That took a bit of time since I had to be careful I didn�t cut any wires. On my second section I separated every second wire. I didn�t notice any major differences except that it was a little stiffer, but not by much. The IDE drive cables had their wires much closer and I had to be very careful not to cut into the wire. I recommend cutting every fourth strand just to be safe. It will still give a good amount of flexibility. Each strand was cut approximately half an inch, which was then carefully pulled apart. At this point you�re pretty much done and only need to tape/tie the strands together. 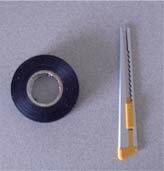 The amount of tape/tie you need to hold the wires together is dependant on the length of the IDE and your desired end look. The second option is to just fold the wires down and hold them by using tape or zip ties. My pictures are pretty much self-explanatory so I�ll just cut to the chase. I personally don�t like having the cables zip tied. I notice when cutting the excess zip tie with scissors, it created a sharp edge. This can cause a bit of annoyance while adjusting cables or adding/removing components. But this would be ideal for someone whom doesn�t add/remove components that often. I recommend spending the extra time separating the IDE cables with a blade. The separated wires give a greater flexibility and make it easier to get around inside your case than having it folded. This is a good project for beginners or even the more advanced user and making their pc run a little cooler. I would like to thank Aaron (Ludicrous) for taking the time to edit and suggest improvements for this article and hope everyone find use of it. Copyright � 2000 CPU-Central, All rights reserved.